At the beginning of the season, I picked up two boxes of 2016-17 Upper Deck Artifacts. Of those two boxes, I pulled a total of 3 redemptions. 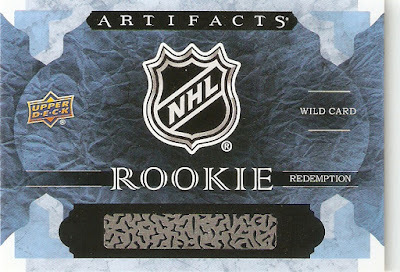 Now, these weren't the typical ones where the athlete hasn't found the time to sign, but the ones where the released the product before the new athletes played in an NHL game, and thus couldn't have a hockey card until they do. Anyway, truth be told, I set my redemptions aside and forgot about them until a couple of weeks ago. By the time I entered them in, they had already been produced, so it wasn't long at all before they were on their way. 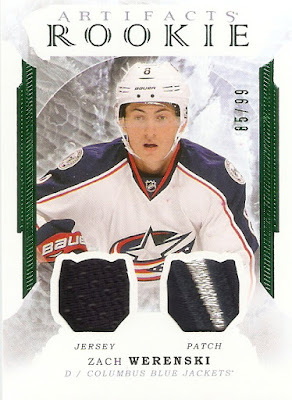 First up is what I got in return for an Emerald Jersey Patch card of "Rookie V."
While there was no telling who the card would be of early on, it ended up being of Columbus Blue Jackets defenseman Zach Werenski. IT is numbered 85/99 and the cool thing about Blue Jackets sweaters is that they have some great patch pieces, like this one, which appears to be from the point of the star on the upper right corner. 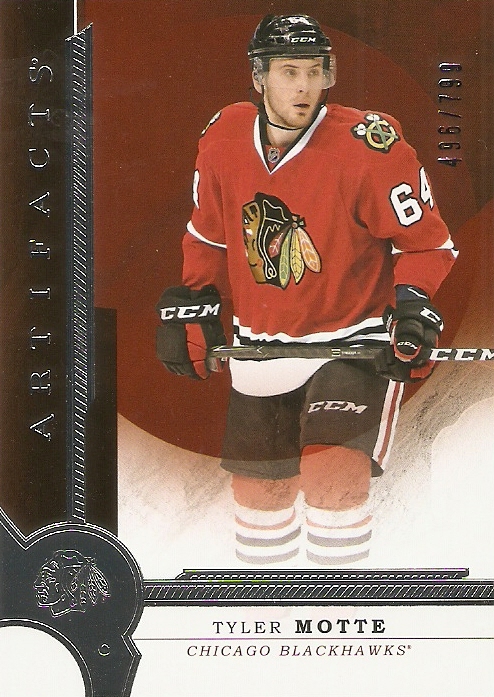 This one is of Tyler Motte, and in numbered 496/799. As a University of North Dakota Hockey fan, I was hoping it would be Nick Schmaltz, but maybe Motte will turn out to be a great player, as well. He split time between the NHL and AHL last season, but didn't make an appearance in the playoffs. Lastly, is one that I thought was lackluster, but turned out to be pretty great, a "Wild Card" redemption. 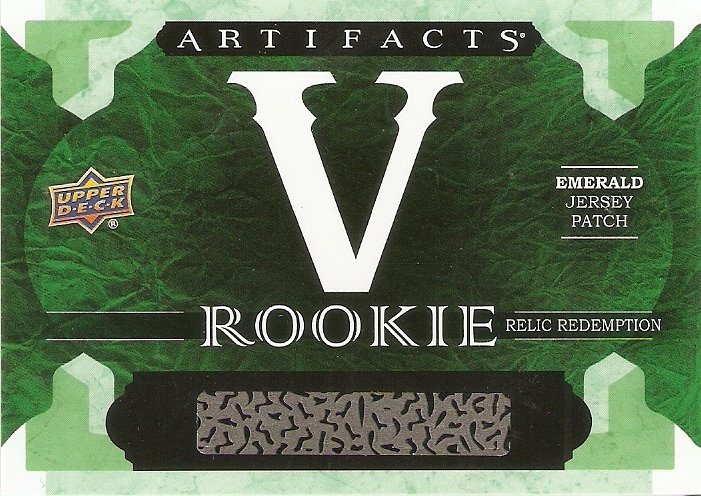 The wild cards are designed for teams who have more than one big-time rookie on their roster. I hit big with this one, too, getting a card of Toronto Maple Leafs right wing Mitch Marner, numbered 495/799. Despite a lot of hype for him coming into this season, Marner gets a wild card spot, because he is on the same team with #1 overall pick Auston Matthews. He still had a great first year, though, scoring 19 goals and 42 assists in 77 games. The wild cards are sometimes more miss than hit, but in this case, I got a good one. 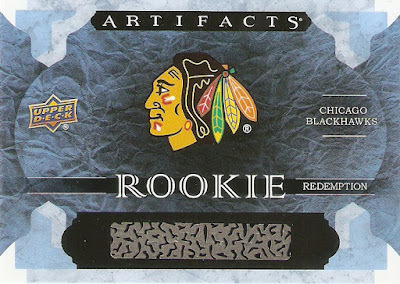 That's it for this year in Artifacts. I'll see what 2017-18 brings, but as the first mid-range product of the season, I'll definitely pick up a box or two when it gets released in the fall. I actually, don't remember what I spent on this card, but I know it was more than $10. 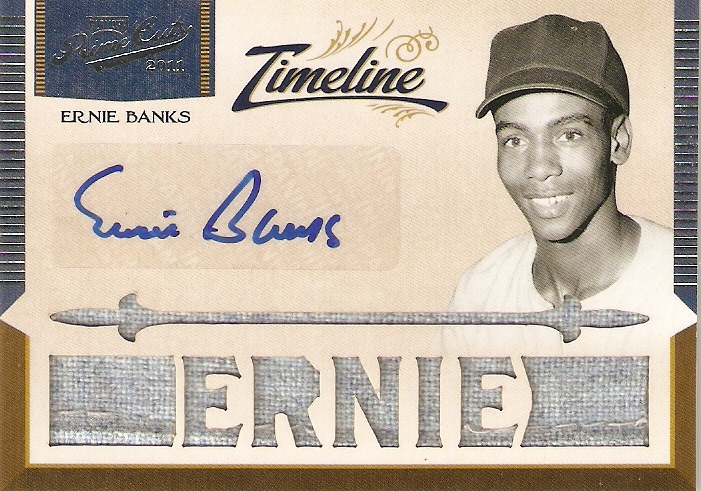 From 2012 Panini Prime Cuts, this is an autographed jersey card of Chicago Cubs legend Ernie Banks, numbered 7/10. It is a sticker autograph, which always goes a little cheaper than the on-card variety, which is nice for that reason. 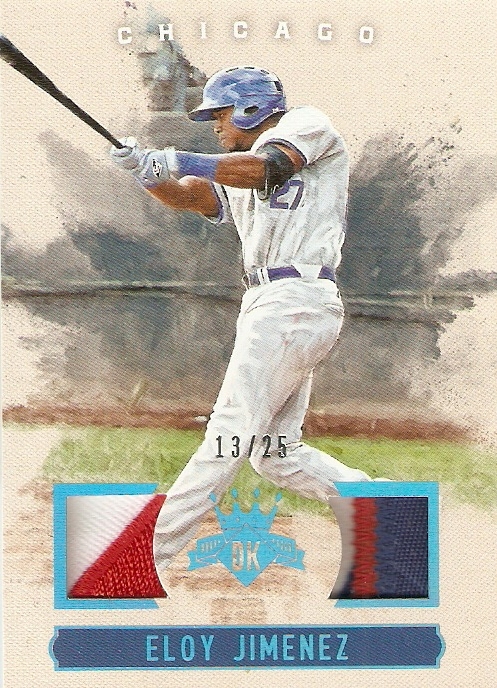 What's really cool about the card, though, is the jersey swatch. First of all, his name is cut out, which is a feature I always love. secondly, this is the old-timey fabric, which really looks lime more of a memorabilia piece than just a piece of fabric. Thirdly, if you look toward the bottome of the fabric, you will see a seam, which really gives it that extra touch. Like I said, I really don't remember how much I spent on this exactly, but I still think it is worth every penny I paid for it. Now, my all-time favorite player is Ryne Sandberg. Unfortunately, I only have one certified auto of his, and I'm saving that one for a later post. 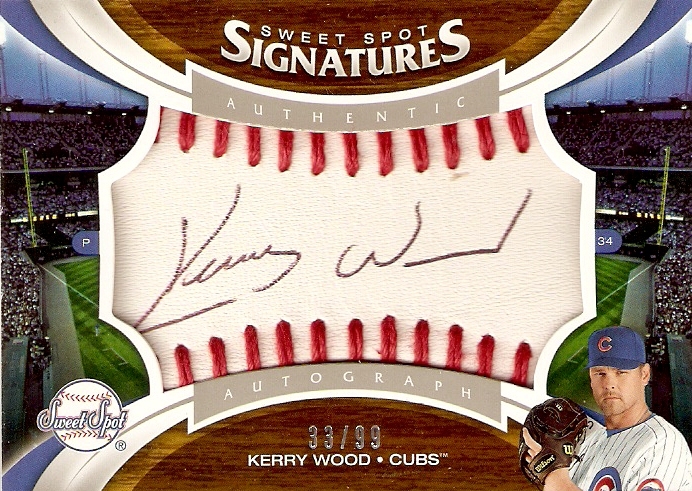 Luckily, this one has to do with "one of" my favorite players, so I can post this beauty from another favorite Cub from my era, Kerry Wood. Wood entered the Majors with a bang, tying Roger Clemens' record of 20 strikeouts in a game in only his fifth major league start. 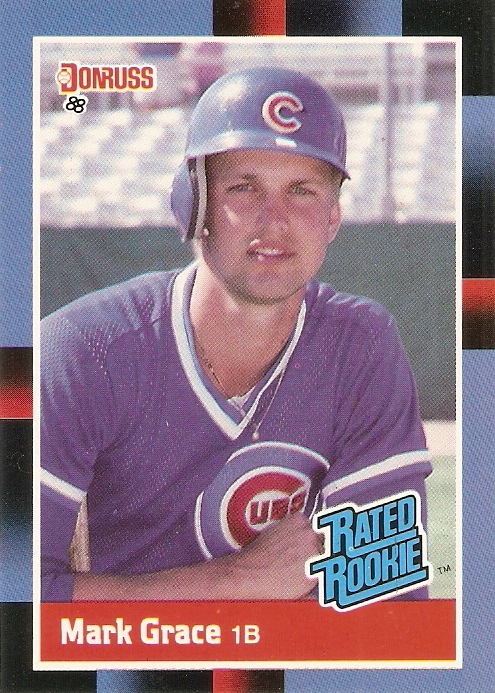 He was set to be the cubs' fireball pitcher of the future, but missed what would have been his second season in the Majors after undergoing Tommy John surgery on his right elbow. He would return and eventually regain his momentum, leading the league in strikeouts, with 266 in 2003. He would later on play for the Cleveland Indians and New York Yankees, but returned to the cubs for the 2011 season. He retired in 2012, and played his last game on May 18 of that year. He faced just one batter that game, who he struck out. 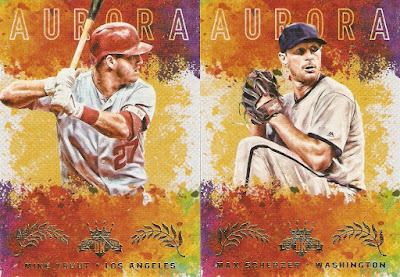 After being impressed with one box of 2017 Diamond Kings, I decided to try my hand at another, and boy, am I glad I did. Not only is this still such a great-looking set of cards, but I ended up with an even better box this time around! 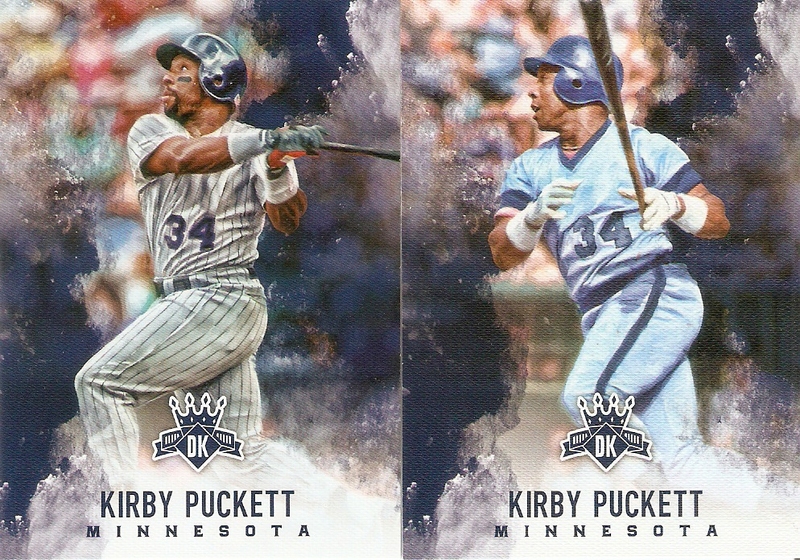 I pulled both versions of Kirby Puckett's card, to give you a look at the differences. Sometimes you'll get different poses, while other times it's different uniforms. 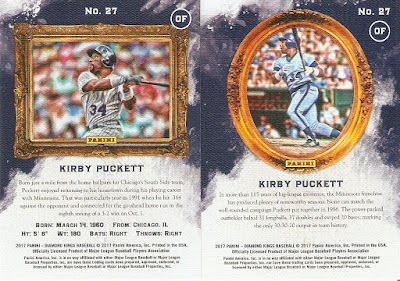 Here we have pictures of early-career Puckett and late-career Puckett. 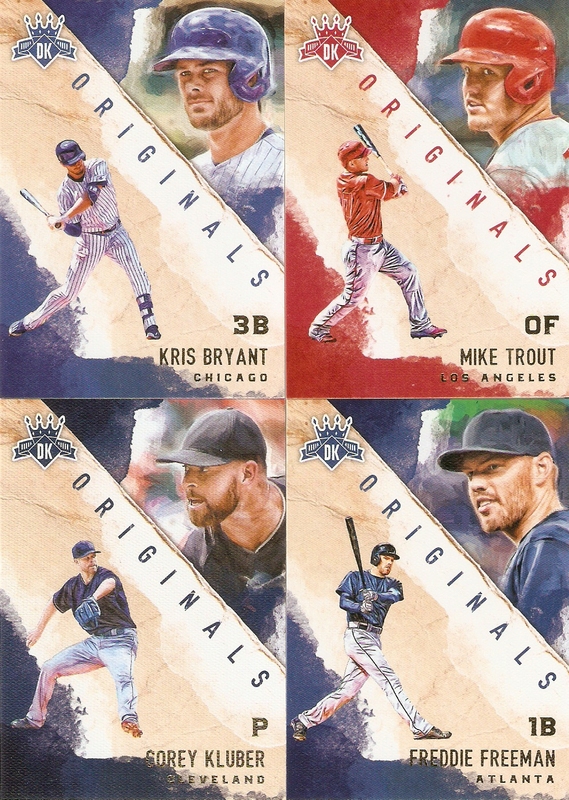 On the non-rookie cards, they also changed the back to make it easier to identify which one is the regular card (square frame) and the SP variation (round frame). 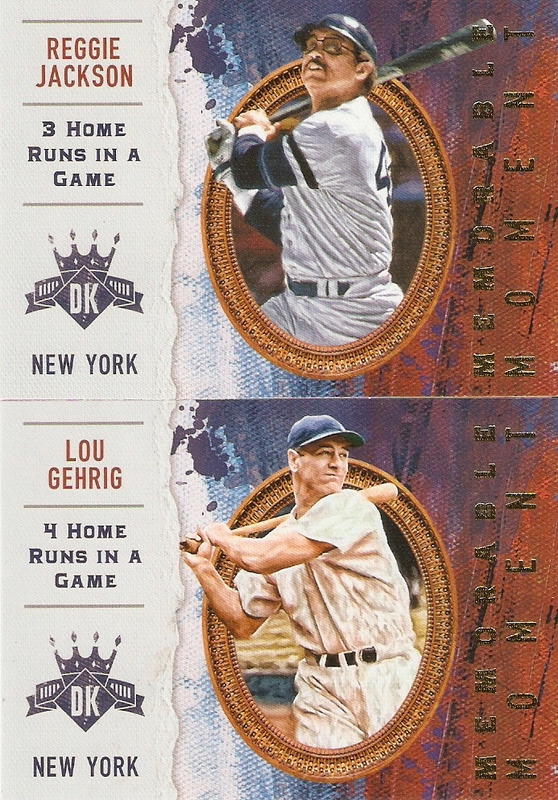 There were two Memorable Moments cards of big home run games for the Yankees. 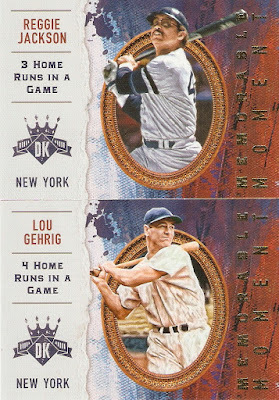 These two focus on Reggie Jackson hitting 3 home runs in a game and Lou Gehrig hitting 4 home runs in a game. Each box promised two hits, and like the last one, both were pretty good ones to pull. The first is a Limited Lithos autographed dual jersey card of Los Angeles Dodgers pitcher Ross Stripling numbered 34/49. I can't say I know a whole lot about this guy, but when compared to what most guys do nowadays, he has a great-looking signature, which makes this card even better. Lastly, is my best hit out of both boxes, a dual patch card of Chicago Cubs top prospect Eloy Jimenez, numbered 13/25. Jimenez may have another year or two before he cracks the major league roster, but with a great year in A-ball last season and an impressive performance at the 2016 All-Star Futures Game, he'll be ready when the call comes. Not only is this card of a soon-to-be-great player, but the two patch pieces look amazing. The one on the left most likely comes from the logo on the front of the jersey, and the one on the right is probably from a number. You can even see a bit of a pinstripe, as well. another great box at a fantastic price. I'm telling you, as far as fantastic-looking cards at a great value go, you really can't beat Diamond Kings. I wasn't raised a Cubs fan, but I became one at the age of 9 thanks to WGN and Harry Caray. I was too young to understand a lot of the intricacies of the game, but I did know thaqt this guy was the best on the team, and he became my favorite player. 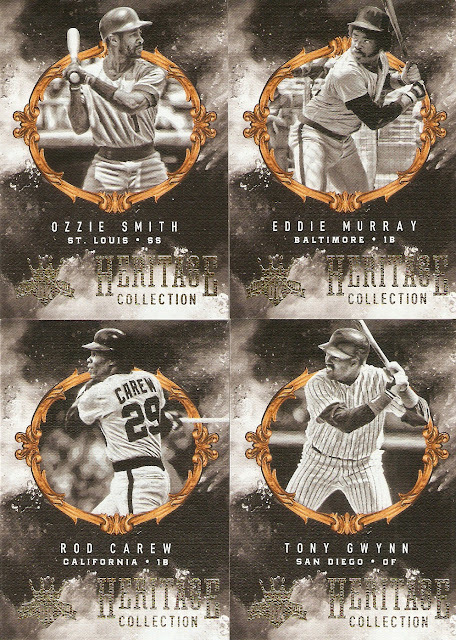 As a young card collector, I picked up whatever cards of his I could, but most of them were the recent releases. This one eluded me for a long time, mostly because of the price. It probably never got above$30, even during the peak of his career, but for a kid in elementary school, it was WAY out of my price range. 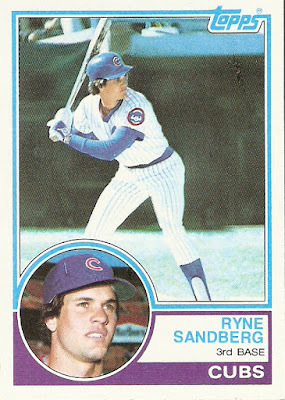 It was my first "white whale," and there was a great sense of satisfaction when I finally purchased the card as an adult. I'm going to tweak this one a little bit. 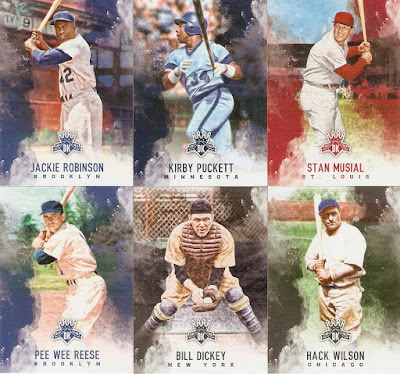 Truthfully, I don't remember what the very first set that I tried to complete was, so instead, I'll tell you about the first set of cards that I really got into for my pack buying as a young collector. Looking back on it now, 1988 was a rough year for cards. It's right at the beginning of the "junk wax" era, the designs were mostly pretty boring, and the rookie class was very slim. The one bright spot for me as a young collector was 1988 Donruss. As an 8-year-old, I loved the design. It had a futuristic look to it, and most importantly to me at the time, the alternating corner designs fit together like a puzzle when you put them in a binder. How cool is that! Of course, almost 30 years later, I see them for what they are in full context, but the 8-year-old version of me thought these were AMAZING! 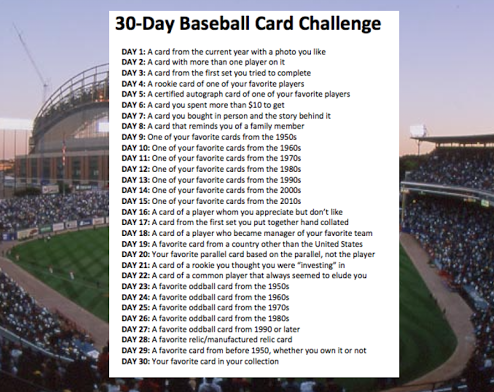 30-Day Baseball Card Challenge - Day 2: A card with more than one player on it. I had a few to pick from, and was looking at some vintage cards, when I remembered that I had this beauty. 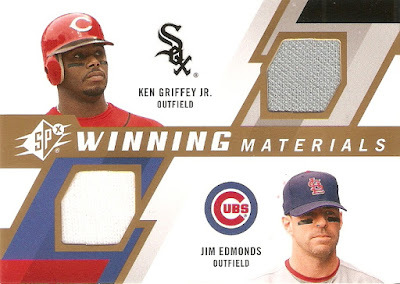 It's a Winning Materials dual jersey card of Ken Griffey, Jr. and Jim Edmonds from 2009 SPX. I chose this one, because it's an incredibly unique card in that it features two players, but four teams. 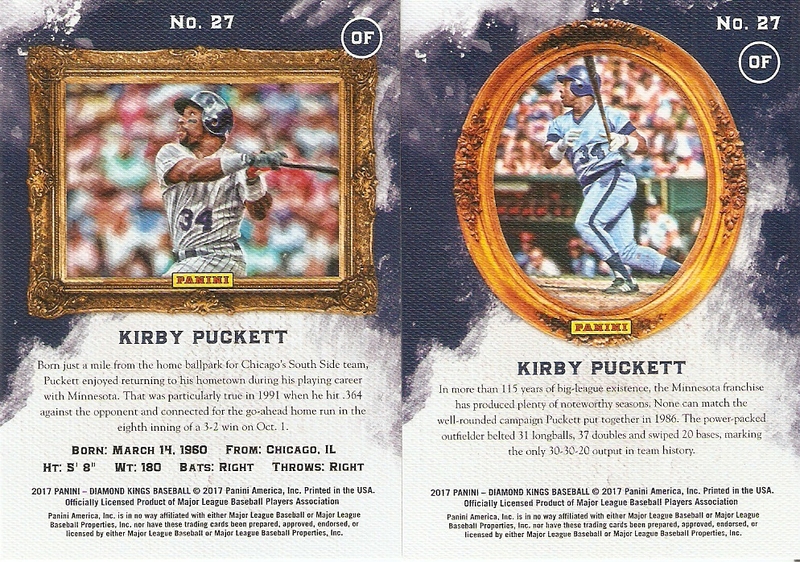 Griffey is pictured as a Cincinnati Red, but listed as a member of the Chicago White Sox, and Edmonds is pictured as a St. Louis Cardinal, but listed as a Chicago Cub. Griffey was traded from the Reds to the White Sox at the trade deadline in July 2008, and Edmonds left the cardinals and signed a 1-year contract with the Cubs in May of that year. 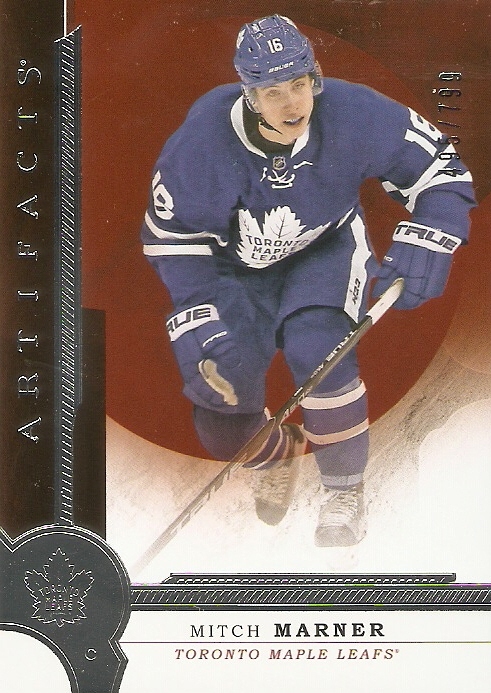 Despite this being a 2009 product, I guess there wasn't enough time for Upper Deck to get updated photos of them. 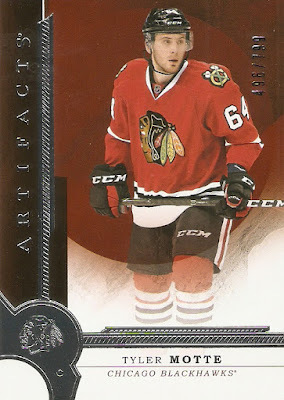 The only other card I have that 1-ups this one is a hockey card of Marian Hossa that has him listed as a Detroit Red Wing, pictured as a Pittsburgh Penguin, and has a jersey swatch from his time with the Atlanta Thrashers.